Why not pay off the national debt? So they can spend the money on stupid crap? 1. Taxes won't make you rich, the taxes go to the government. Why do you want the money to go to the government? They will just spend it away. 2. Why do you think you deserve the money? Work hard for it first. Make up your mind, do the taxes go to the government or to the poor? And do you realize, it is a frightening reality that we have to "feed" the rich in order for this country to survive. As some of you pointed out, if the rich are taxed more, they may just cut costs at the expense of the poor. It is this very system that I am uncomfortable with, one not unlike the aristocracy in the middle ages (it may even be argued to be more disproportionate than them, actually), nor unlike the billionaire sheikhs standing out in the Arab world. And don't tell the people complaining to go get a job instead of posting here, I'm sure everybody has time to write a few lines in an online forum, or is it so bad for the poor that they have to work 16 hours a day without a single break? That would also contradict your argument, showing that the poor SHOULD be working hard non-stop. If the harder you work, the richer you get, then how is it that billionaires have the time to go on expensive holiday cruises? Shouldn't the richest person in the world be one who breaks the world record for longest hours of work per day then? Because I believe in freedom, including the freedom to keep what you earn. i dont necessarily see myself becoming rich one day, though that would be nice, however i do recognize the fact that i never got a job from a poor person, and a poor person never gave me a paycheck. Don't kid yourself, you are capable of work whether rich people exist or not, it's just that you need their permission to work. You sound like: "Milord is so graceful, for he provides me food and clothes that get me past the harsh winter nights. Your humble servant is always at your service for this." Do you actually sense the problem in WHY a poor person cannot give you a paycheck? Why they cannot have you work for them and get you to earn money for them just as the rich so easily can? Do your parents pay your bills as well now? The mass of people use roads and services, they should be expected to share the responsibility of taxation. What you are talking about is tyranny of a majority. Find a majority and vote a theft of other people's money for YOUR benefit. PATHETIC IMO, something to be VERY ashamed of. Our wealthy were cut in half the last 6 years and pay tons of taxes and are already people taxed among the most in the world. They don't have the money YOU NEED. Earn more yourself and learn to emulate success rather than trying to punish other's success. America needs more stupid crap, like a CD: "The Greatest Hits Of Michael Jackson's Doctor". If the wealthy have it going so bad for them, why don't they just donate all their money to charity and go live with the tyrannical poor majority? This is a great thread. 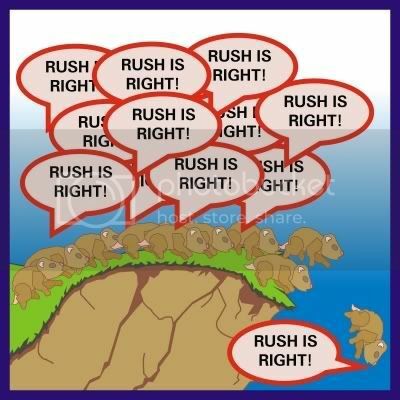 I think that a lot of people view themselves as one day becoming "rich," so anything they view as a hindrance to their path they blame on "big government" or "socialists" or fill-in any other Glenn Limbaugh term. Or, letter Q, those people bring jobs like when they build, oh IDK, a $3.1 million home with cash. Guess how many people that employes?